Line a 7 inch springform with parchment paper. Prepare crust by pulsing peanuts and coconut oil in food processor. Pulse until crumbly. Press peanut crust firmly into bottom of springform. Rinse out food processor and pulse coconut cream, banana, and maple syrup together until creamy and smooth. Spread coconut-banana filling over peanut crust. 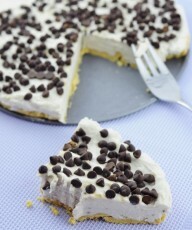 Sprinkle chocolate chips on top of filling. Place in freezer for at least 10 minutes until firm then remove from cheesecake from springform and serve. 1) To make this recipe raw vegan, use raw peanuts and omit maple syrup.2) Pulse peanuts and coconut oil just enough to make a sticky and crumbly crust. You don't want the peanuts to turn into peanut butter. 3) Allow edges of cheesecake to freeze well before attempting to remove from springform.4) Store cheesecake in fridge. If fridge is not cold enough, store in freezer and allow enough time for it to thaw.5) You can use store bought coconut cream or place a can (or two depending on brand) of coconut milk in fridge for at least 4 hours. Carefully, without sloshing the coconut milk around, open the can. Scoop the hard white coconut cream out of the can.